Following a year-long public engagement process centered on data mapping, crash analysis and public workshops to conceptualize solutions to the Tampa Bay region's alarming pedestrian and cyclist fatality stats, the Vision Zero Hillsborough coalition is busy pursuing an Action Plan designed to encourage you to get engaged to make a difference. Striking throughout the Action Plan are the victims of traffic violence. Several shared their stories at an August 22 workshop at Tampa Theatre. But most striking is the diversity of the faces who prompted by tragedy have become advocates for Vision Zero. Faces like that of Valerie Jones, whose 17-year-old daughter, Alexis, was killed crossing Busch Boulevard on her way to Chamberlain High School in 2015. Faces like Michael Schwaid, who nearly lost his life to a drunk driver while biking to work last year, and his wife, Barbara, who cannot erase the memory of her husband's screams echoing outside the hospital room where she found him a few hours after he failed to check in from his morning commute. As Vision Zero moves forward, it does so with a stark reminder: The victims of traffic violence are children and their parents who survive them; they are our neighbors, friends and grandparents. When the lives of loved ones are on the line, every citizen is a stakeholder in the mission to achieve zero traffic deaths in Hillsborough County. Here are ways you can get involved today with Vision Zero, broken into each of the coalition's four Action Tracks. Implementing low-cost treatments to improve the safety of the roadway, particularly for vulnerable users. Organize a neighborhood event: Know of a spot in your neighborhood where a splash of color and creativity would encourage drivers to slow down and look twice for kids and pedestrians? South Seminole Heights became the first neighborhood in Tampa to participate in the city's Paint the Intersection pilot program this summer. Team up with your neighbors, and contact the Transportation and Stormwater Services Department at 813-274-8333 to paint an intersection in your neighborhood. Look for opportunities for low-cost, high impact improvements: Ken Sides, senior engineer with Sam Schwartz Tampa and leader in the PSL committee, notes that PSL solutions often rely on creativity and community brainstorming -- no traffic engineering expertise required. Have an idea? Join the Bicycle Pedestrian Advisory Committee and share your ideas with the Hillsborough MPO. Increase awareness of Vision Zero to influence safer behaviors on roadways. Talk to your family: In-person outreach is central to the Vision Zero mission. Talk to your family about traffic violence and how they can change their behavior -- both behind the wheel and on foot and bike -- to reach every destination safely. Visit Families for Safe Streets to learn how families who have lost loved ones to traffic violence channel their grief into advocacy as part of the Vision Zero NYC movement. Get engaged on social media: Like and follow Vision Zero Hillsborough on Facebook and use the #VisionZero813 hashtag to track the coalition and spread the word. Take the Vision Zero Pledge online and share your own story. Join the Speakers Bureau: Central to the One Message, Many Voices Action Plan is a newly developed Speakers Bureau, a platform for victims of traffic violence and roadway safety advocates. Email MPO Executive Planner Gena Torres for more info. 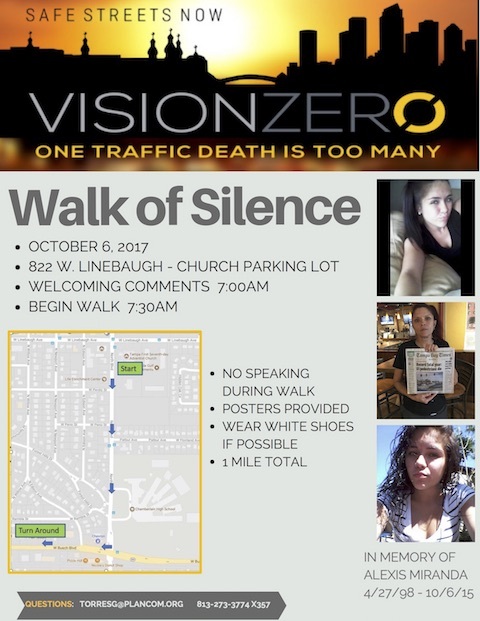 Attend the Walk of Silence: Join Vision Zero's Oct. 6 Walk of Silence on Busch Blvd in remembrance of lives lost. Leverage capabilities and existing resources for equitable, "consistent and fair" enforcement for all road users. Provide comments about safety issues along high-crash corridors: Scroll to find a map on the Vision Zero webpage where you can pinpoint safety concerns and provide your comments. Spread the word about why traffic enforcement is critical to Vision Zero: Be vocal about the dangers of texting and driving (responsible for at least 19 percent of fatal crashes nationwide), speeding (reported in Vision Zero data as the fundamental factor in severe crashes), and impaired driving (responsible for 23 percent of traffic fatalities in Hillsborough County). Start a Walking School Bus in your neighborhood: Influencing good driving behavior begins long before teens take the wheel. Get a head start by organizing a Walking School Bus in your neighborhood to keep kids safe on their way to school and encourage mindful traffic behavior. Integrate context-sensitive design practices for safe communities and roadways. Check out the new FDOT Design Manual: In 2014 the FDOT adopted a Complete Streets Policy for improved multimodal design strategies on state roadways. The draft for the FDOT Design Manual (2018) will influence practice in designing more context-sensitive state highways, and is a valuable resource to comprehending Complete Streets design principles as they apply to all roadways. Join the Hillsborough MPO Livable Roadways Committee: Want to stay informed and have a voice in Hillsborough County road design, transportation policy, pedestrian and bicycle infrastructure, and land use? Join the Livable Roadways Committee to be involved in influencing context-sensitive design practices in your community. View the full Vision Zero Action Plan here.